This is not surprising; Yellowstone has blown up–literally–three times, been inundated by massive lava flows, bent, folded and shaken by earthquakes, and scraped relentlessly by a series of all-covering ice age glaciers. Not to mention routine erosion from wind, rain, and frost. And that’s only in the last few million years, a mere blink of the eye in geologic time. As you drive around Yellowstone today; it’s peaceful. The land looks much like it has for thousands of years, and as it will probably continue to look for some more thousands of years. One thing many people will notice is the altitude. Most of the park is between 7,000 and 8,000 feet above sea level (2,000–2,500 meters), higher than any elevation in the American east. The oxygen is thinner here, not enough to cause discomfort for most people, but even people in good condition might wonder why they can’t run trails without puffing. The altitude also affects the weather; for one thing, it’s cooler. Temperature drops about 3 degrees Fahrenheit for every 1,000 feet of altitude, which in part accounts for why you can leave Idaho Falls, Idaho (4,747ft/1445m) when it is 90ºF and arrive at Old Faithful (7,265ft/2254m) where it is 78ºF. The altitude of the park also affects precipitation, in effect wringing moisture from the clouds, especially in winter. The highest point in Yellowstone Park is Eagle Peak: 11,358ft/3462m (located in the Absaroka Mountains on the southeast boundary of the park). The lowest point is Reese Creek: 5,282ft/1610m (located a few miles northwest of Gardiner, Montana on the north boundary). 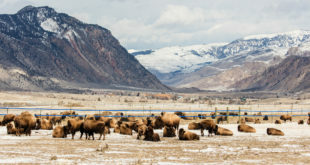 As parks go, Yellowstone is fairly large: 3,472 square miles (8,987 square kilometers), a bit larger than the American states of Delaware and Rhode Island combined. The largest U.S. National Park is Wrangel-St.Elias in Alaska: 20,587 square miles (53,321 square kilometers). If you get the chance, stop for the view at one of the roadside parking areas on Mount Washburn, particularly those on the south side. Nothing demonstrates better the size and majesty of Yellowstone National Park. On a clear day it’s possible to see more than fifty miles, all the way to the Grand Teton Mountains. Another thing people will notice, especially the person at the steering wheel, is the rugged land makes for ‘interesting’ roadways. Sharp, narrow curves are in good supply as the Grand Loop Road snakes its way through deep valleys, past the continental divide, and over Mt. Washburn. Although the park service is forever working on the roads, there are plenty of locations which demonstrate the difficulties of road maintenance in mountainous terrain with harsh winters. Of course, the rugged terrain is what makes Yellowstone so spectacularly beautiful in so many places.